Thursday, August 2, @ 6:00pm in the Lower School Commons. Sunday, August 12, @ 6:00pm in the Upper School Gymnasium. Monday, August 13, @ 6:00pm in the Upper School Gymnasium. Tuesday, August 14, from 10:00am -- 12:00pm. Wednesday, August 15, is an early dismissal day. LS: 8:10am--11:45am; US: 8:00am--12:00pm. Thursday, August 16, is a full day of school for both Lower and Upper Schools. LS: 8:10am--3:10pm; US: 8:00am--3:15pm. The 2018-2019 class lists will be emailed on Sunday, August 12, at 5:00pm. Parents are responsible for sending their children with correct dress and grooming. Determination of dress code violations will be the responsibility of the principal. The following guidelines apply to all dress code categories - School Uniform, Casual, Recreational, and Dressy/Performance for grades K5 through 6th grade. Neatly groomed, conservative style and color. Extreme or counterculture hairstyles are not permitted. Hairpieces may not be worn unless medically necessary. No more than one earring per ear and it must be in the earlobe. Tattoos and body piercing are not permitted. Caps and hats should not be worn unless administration gives specific approval. Length: not completely covering ears or touching collar or eyebrows. Caps or hats may not be worn unless administration gives specific approval. Earrings, tattoos, and body piercing are not permitted. Lower School girls may wear a red or navy “polo dress” with shorts underneath. This dress has a drop waist and collar, and is made from the same fabric as our uniform polo shirts. Pants and jogging suits are not permitted underneath jumpers. Solid leggings of white, red, blue, or gray are permitted underneath jumpers. Girls may wear a plaid or khaki jumper with uniform or peter pan blouse. Long or short-sleeved solid color polo knit shirts with two or three buttons, in red, white or navy must be worn with pants, shorts and skorts. Short sleeve red monogram shirts with CCS emblem are required for special events as denoted by school. These are to be purchased from The Toggery. White long-sleeve shirts may be worn under short sleeve shirts. There should be no writing on the sleeves. CCS sweatshirts and hoodies are the only sweatshirts and hoodies permitted. These must be worn with a uniform polo or school t-shirt underneath. Jackets are defined as an overcoat with a full-length zipper. Logos are permitted but must be smaller than a softball. They cannot be worn during class. Traditional crew neck, v-neck or cardigan sweaters in navy, gray, red or white may be worn with the uniform (no longer than hip length). K5 through 6th grade girls must wear navy or khaki style (ankle length), with back pockets that are inside. Hip huggers and low riders are not permitted. Pants must be neatly hemmed without tears or slits at the bottom hem. They may not have any loops or pockets on the outer leg of the pants. Pants with belt loops must be worn with a buckled belt. K5 through 6th grade girls must wear shorts that are hemmed. Cuffs are optional. Shorts with belt loops must be worn with a buckled belt. No sash, chain or scarf belts are allowed. The time of year the shorts are to be worn will be left up to the discretion of each family. For girls in Lower School, skorts fall under the same guidelines as skirts. The skirts need to be of appropriate length and must be worn with shorts or leggings underneath. Flip flops, sports sandals, crocs and house shoes, light up shoes and shoes with wheels are not permitted. All students must wear closed toed shoes or tennis shoes. All boots should be of a neutral color. Socks must always be worn with all shoes. Shoes with laces must be tied. Knee or ankle length. Socks should be no more than two colors with no emblem or logos. In case of cold weather, tights or leggings may also be worn in red, white, gray or navy. Long or short-sleeved red, white, or navy knit polo style shirt with two or three buttons must be worn with pants or shorts. Emblems will not be permitted on the shirt. Short sleeve red monogram shirts with Conway Christian School emblem are required for special events as denoted by school. These are to be purchased from The Toggery. White long sleeve shirts may be worn under short sleeve shirts. There should be no writing on the sleeves. CCS sweatshirts and hoodies are the only sweatshirts and hoodies permitted. These must be worn with a uniform polo or Conway Christian School t-shirt underneath. Jackets are defined as an overcoat with a full length zipper. Logos are permitted but must be smaller than a softball. They cannot be worn during class. K5-6th grade boys must wear navy or khaki style pants (ankle length with back pockets that are inside). K5 boys may wear non-belted elastic waist navy or khaki uniform pants and shorts. Boys in grades 1-6 must wear khaki/navy pants or shorts with belt loops. Pants and shorts must be neatly hemmed without tears or slits at the bottom hem. They may not have any loops or pockets on the outer leg of the pants or shorts. Knee or ankle length. Socks should be no more than two colors with no emblem or logos. Socks must be worn with all shoes or boots. Teachers will indicate appropriate clothing for each special occasion. All clothing must be of modest design and not promote a philosophy that goes against the school’s standards. Parents are responsible for sending their children with correct dress and grooming. Determination of dress code violations will be the responsibility of the principal. The following guidelines apply to all dress code categories - School Uniform, Spirit Dress, Dressy/Performance, and Formal Occasion. Must be clean shaven, facial hair not permitted unless approved by the administration. No visible earrings, tattoos, and body piercings are permitted. Students may wear button down collar oxford shirts. They may be of any color and also different styles (plaid, striped, checked, etc.) while adhering to our no logo policy. Polo shirts must have buttons and be buttoned appropriately. Any solid color is permitted. Khaki (tan) or navy pants only (traditional, classic cut-moderate flare cut acceptable, but no bell bottoms or skinny jeans). Shorts must be navy or khaki school uniform shorts and no shorter than 3” from the middle of the knee. No baggy, cargo type pants or shorts. No painter pants. Shorts must have belt loops and be worn with a belt. Must fit properly – no baggy or saggy pants. Pants must have belt loops and be worn with a belt that matches basic uniform. No holes. Pants must be neatly hemmed without tears or slits at the bottom hem. Jean style, or drawstring pants or shorts will not be permitted. Patch pockets or flap-pockets are permitted. Leggings permitted only with approved skirt and dress middle-of the- knee length. Must be of closed toe variety. Tennis shoe, leather loafer or dress shoe, dressy sandal, or boots are examples. Sweaters, sweatshirts and fleece pullovers must have a colored polo or shirt under them. There is only one approved athletic team apparel, approved by the school, that can be worn to school on the day of athletic events. The apparel will be made available to all athletes through the athletic department. Seventh grade students, please join us after Open House on Tuesday, August 14, from 12:00pm-2:00pm. This will be a fun time to get to know your teachers, the campus, the new technology (iPads will be issued during this time) and answer any questions. We look forward to meeting you and to get to know you even better throughout the 2018-2019 school year! Students in grades 7-9 will receive an iPad. 7th grade students will receive their iPads during Boot Camp. 8th thru 9th grade students will receive their iPads during the first week of school. Students in grades 10-12 will receive a Chromebook. 10th thru 12th grade students will receive their Chromebooks during the first week of school. Conway Christian parking stickers are on sale for $2.00, in the Upper School office and will be available during Open House on Tuesday, August 14. Senior students will receive priority parking! Upper School students will each be issued a locker to use during the 2018-19 school year. Locks are on sale for $10.00 in the Upper School front office. Students may utilize a lock from the previous year. The locks will be available for purchase during Open House on Tuesday, August 14. Please complete the following forms and return to the Upper School office before Friday, August 24th. The Extended Care Program at Conway Christian is a before and after school child care program provided for our students PreSchool through 6th Grade. 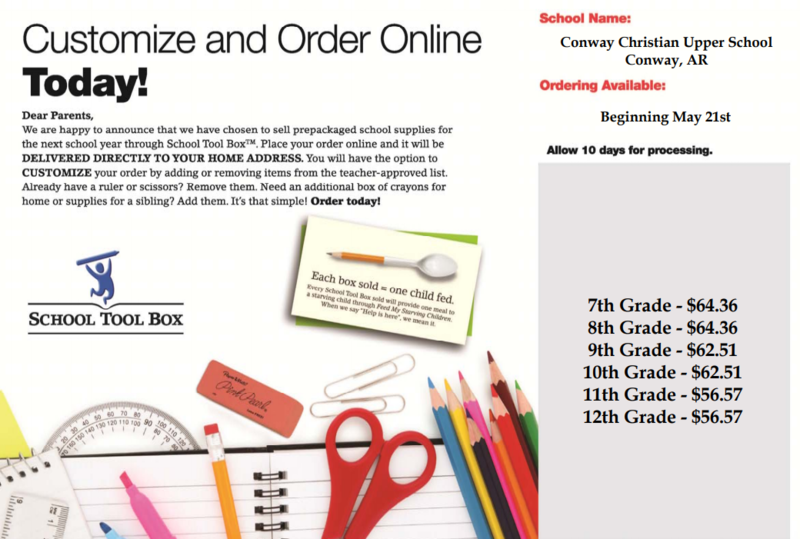 Conway Christian's Before Care begins at 7:00am and the Afternoon Care begins at 3:10pm. The program provides a safe environment, an encouraging atmosphere, and an opportunity for your child to continue growing academically, spiritually and socially. The Extended Care Program is certified by the Arkansas Department of Human Services (DHS) as a licensed child care provider. Many of our Extended Care Staff are teachers and are CPR certified. The Eagle's Nest will be opened for online sales beginning Saturday, August 4, for tax free weekend. Click here to show your eagle pride and collect your back to school attire. The physical store will be opening Tuesday, August 14, during Open House from 10:00am--12:00pm. The Eagle's Nest is open in the Lower School every Monday, Wednesday & Friday from 7:45-8:45 AM and 2:30-3:30 PM. 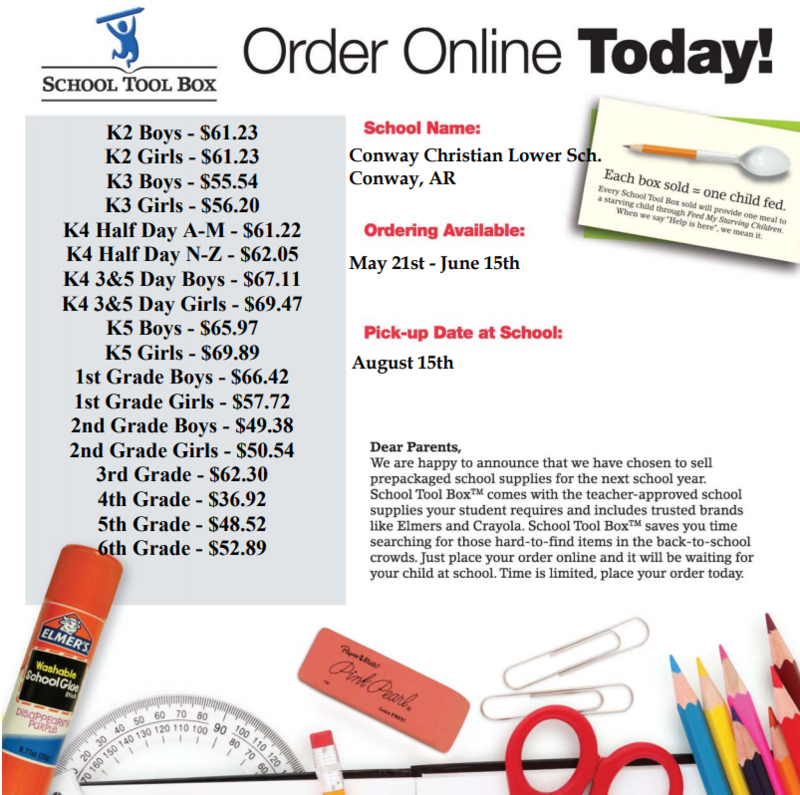 Orders placed after June 15 will be delivered directly to your home. MBS Direct will provide new and used textbooks for grades 1-12. All required textbooks are available through MBS Direct's online bookstore and will no longer be available on Conway Christian's campus. Student iPads and Chromebooks have the Bookshelf app loaded for students to access eBooks. Students need a username and password to access their eBooks in the Bookshelf app. The student account is created by parents on Vitalsource.com after purchasing eBooks from MBS or Bob Jones. By enrolling my child(ren) at Conway Christian School, I understand that the school may publish photos of my child(ren), and their name and likeness, for use in the Conway Christian School’s print, online and video based marketing purposes, as well as other Conway Christian publications.